If you have pets accidents are going to happen. And for some reason my dog prefers puking on carpet rather than easy to clean tile, but what can you do? Accidents happen. 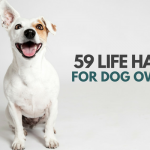 Cleaning up pet stains is never fun, but there are methods that make it easier. 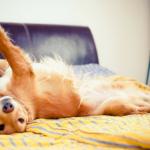 Here’s 10 tips for cleaning up pet stains. If you don’t have any pet stain remover on hand you can make your own DIY cleaning solution with water & vinegar. Why vinegar? Because it’s a non-toxic cleaner than doesn’t leave behind any residue, and because it neutralizes the ammonia in urine that causes odors. To make your own DIY cleaning solution mix equal parts warm water and vinegar and pour it into a spray bottle. I use 1 cup water & 1 cup vinegar, and then use 2 tablespoons of baking soda. That may sound like a lot, but you want to use enough to make sure your solution hits the padding underneath your carpet to help neutralize any urine that may have soaked in. Spray the urine spot with the vinegar & water solution and then sprinkle the baking soda on top. Let the solution sit on the spot for 15 minutes, and then blot it up with a towel before vacuuming it up. And remember to keep your pets away from the area while the solution is doing it’s job. 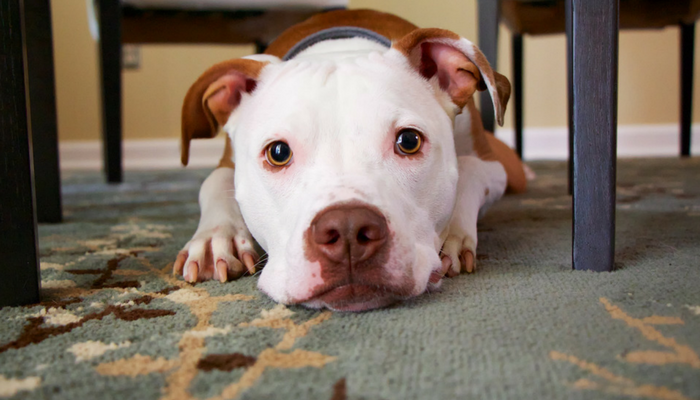 The longer pet urine sits on the carpet the more likely it is to sink in and penetrate the carpet pad underneath, making it much harder to get rid of the smell. Another reason to clean up urine as soon as possible is to avoid any discoloration. The alkaline in urine can bleach carpet dyes over time, which can result in discolored carpet. 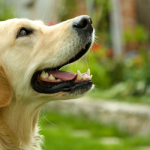 To avoid any lingering smells or discoloration clean up your pet’s urine as soon as possible. Place a towel or some paper towels on top of the urine to soak up as much as possible before cleaning the area. I use paper towels and then stand on top of them to absorb as much urine as possible. You may need to repeat this step a few times before your towels start coming away dry. Once the towels come away dry you can move onto cleaning up the stain. When cleaning up urine in your carpet remember to blot it rather than rub it in. Rubbing will help spread the stain rather than absorb it. Place a towel or some paper towels on top of the urine and stand on top of it to help absorb it into the towels. Absorb as much of the urine as possible with towels before using a cleaning solution. If it’s a larger stain you may need to go through this process a couple of times with different towels before they start coming away dry. It may be tempting to use a steam cleaner on pet stains, but the heat they produce can be counter productive when trying to eliminate pet urine stains. The heat from steam cleaners can bind the protein from the urine into your carpet fibers. Use baking soda on stains will help remove any leftover smells. After cleaning up a pet stain sprinkle some baking soda on top of it and rub it in gently to penetrate the carpet (I use an old toothbrush to rub it in). Let it sit for 15 minutes and then vacuum it up. Baking soda works by absorbing smells, and it’s the reason why people keep a box of it in their fridge. And although baking soda isn’t toxic to pets it can cause stomach upset if ingested; keep your pets away from the area while the baking soda sets in. A lot of pet stains are easy to spot visually, but some do slip by. If you suspect that there’s an old pet stain on your carpet you can try identifying it by smell — or you can use a black light. Urine will glow if it’s hit by a black light, so running one over your floors with the lights turned off will help identify any old stain locations. Use a sticky note to mark the area so you can clean it when the lights are back on. Certain cleaning solutions contain bleach, chlorine and other chemicals that can be harmful to pets, so it’s important to remove as much of those cleaning solutions as possible after using them to clean up pet stains. You can get rid of the excess cleaning solution or residue by rinsing the area with some warm water. Using a spray bottle I spray warm water back over area until it’s well absorbed into the area, and then blot it back up with a towel. When cleaning up dog vomit the first thing I do is put on a pair of rubber gloves, and then I get the dustpan out. If the vomit I’m picking up is chunky or heavy I’ll use the dustpan to pick up the majority of it, and then paper towels for the rest of it. As with urine you’ll want to clean up vomit as soon as possible, before it has a chance to set into the carpet and follow up by cleaning the soiled area. If the vomit has already dried you can use a window scraper (aka squeegee) to try to remove as much as possible before cleaning the area. I prefer using a vinegar & water solution to clean up pet stains (see tip #1), but hydrogen peroxide is another popular option. While it does clean well certain carpet dyes can be discolored by hydrogen peroxide (most modern carpet fibers won’t be effected). If you’re going to use hydrogen peroxide test it out on a small area first to make sure it’s not going to noticably bleach your carpet. Also be sure you’re using the standard 3% hydrogen peroxide that’s available in drug stores. 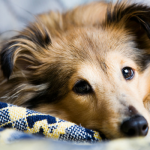 Enzyme based pet stain removers make cleaning up old stains a lot easier. They work by breaking up waste particles, and different types of cleaners target specific kinds of stains. The ones made for pet stains are available on amazon and at most pet stores. 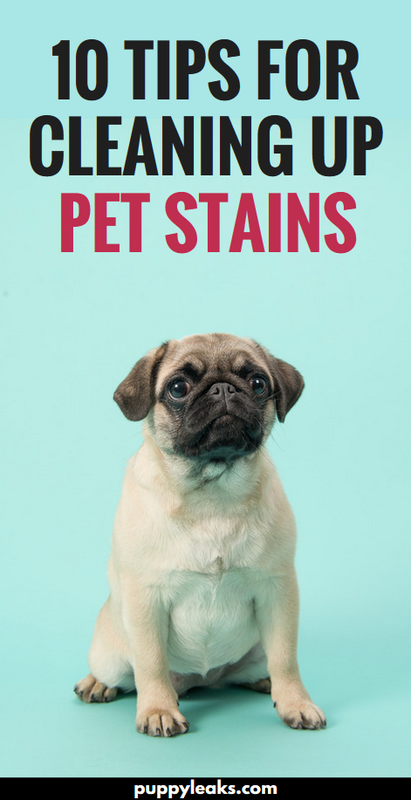 To treat an old pet stain you’ll need to saturate the area with your enzymatic pet stain remover and leave it on until all those urine crystals have dissolved. As long as the area is sufficiently damp and waste particles remain the cleaner will continue to do it’s job. This post contains affiliate links. If you make a purchase I’ll earn a commission. For more information please see our disclosure. Why do they vomit on carpet? And when I’m trying to shove a paper plate or piece of newspaper under their mouths, why do they turn away? Also, why is the vomit ALWAYS a dark color? Why do they only vomit in the middle of the night? And who knew you had those ninja skills? As you can see, I have questions, lots of questions. Your advice to clean up pet urine as soon as possible to avoid discoloration and prevent unwanted odors would be important. It might also help to regularly hire a professional that specializes in pet stain removal as well as if there is a problem you can’t handle. Hiring a professional regularly could keep your floors and furnishings in good condition and prevent smells from building up.